We are home. Still tired, still recuperating a bit, still finishing up the list of “to-do’s” that I put together in the calendar once we arrived. Ten weeks gone does allow certain chores to accumulate a bit. Debris from the trees. Grocery shopping to refill the coffers. Laundry, always laundry. Wash the car, wash the MoHo, schedule appointments, doctors, dentists, eye care, oil changes….I should probably stop here. Except there is a big one on the list, waiting in the corner, whispering to me until I get it done. “Write that last blog about the trip home”. Of course, there is still another one to be written about Saint Augustine, the one detailed post that I didn’t manage to complete while we were on the road, but the Home Run is the one that is hanging over my head like too much laundry. Does that sound like fun? Do I sound tired? I am hoping that slipping back into the writing mode after a few days here at home will rejuvenate my mind and I’ll be able to write something that will be fun for me to read a few months or years from now, and hopefully fun for others to read once I get it posted. I allowed Google Maps to know where I was on this trip. I know, a privacy issue, but still it is a very impressive collection of data. Check out the map of our travels during the last 2 and 1/2 months. We traveled just over 7,400 miles, spent 66 nights on the road, 29 days driving. For those interested in stats, we spent $5,172 total, with a total of $2100 on fuel, averaging 8.5 mpg and $2.41 per gallon for 87 minimum octane. That 85 octane stuff is cheap, but not good for our rig. We spent 8 nights with free camping, including friends, Cracker Barrel’s, boondocking in a truck stop, and a free city park. We spent 24 nights in Military Family Camps, 17 nights in private RV parks, 15 nights in state parks, and 2 nights in a National Park. Camping costs averaged $20.06 per night when including our free nights. We had a wonderful trip overall, and there are amazing moments that we will treasure always. I will never forget kayaking with manatees on the Ichetucknee River, seeing the rainbow blues and aqua colors of the Rainbow River, one last long magical paddle on the Silver River, paddling beside huge alligators in the Okefenokee. I will always remember visits with friends and family along the way, beautiful vistas of deserts, mountains, rivers, forests. I will remember some lovely warm winter days, Florida velvet air, white sands, clear water at the beaches, ancient oaks dripping with Spanish moss. I will fondly remember great meals with friends, and sweet tender pink gulf shrimp melting in my mouth. I will also remember a lot of days waiting for weather to change so we could “do something”. I will always remember the tire blowout over the swamp on the Atchafalaya Bridge, and somehow I will always remember all the dang navigating through more than 15 sets of big metro area freeways. It is a long way from the Southeast part of this country to our home here in the Northwest, no matter how you route the trip. I was ready to be home clear back when we left Arkansas. The distance between where we were and where we were going seemed interminably long. Still, I didn’t want to miss our planned visit to Colorado Springs and Denver, and am so glad we didn’t succumb to skipping that part of the trip. Still, once we left Colorado Springs on the morning of March 24th, there was no stopping us. Sightseeing was dropped to the very minimum. Photos limited to whatever I could manage to shoot from the sometimes very buggy windshield. The days punctuated by driving, each of us taking turns for a few hours, and then stopping to eat, sleep, and wake up to drive again. On our first day, in spite of that desire to get home fast, we succumbed to a side trip. The plan was to travel south on I-25, Colorado Springs to Albuquerque. 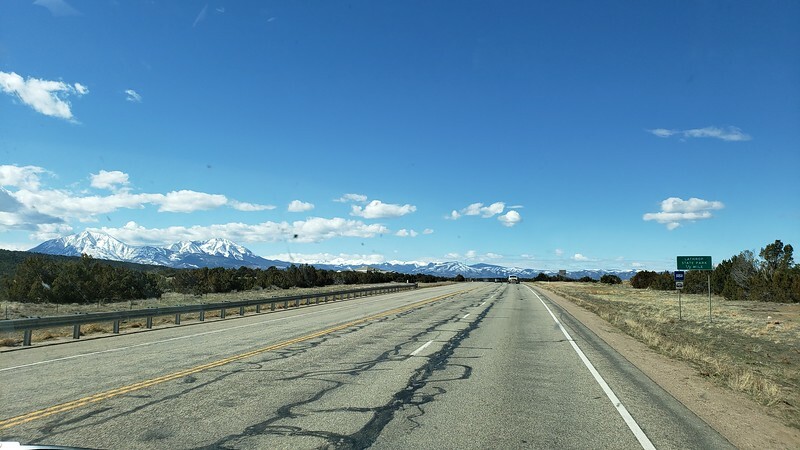 Instead, as we passed the small town of Colorado City, Mo saw a sign for Highway 160, heading due west over the mountains north of Spanish Peaks. I panicked for a moment, wondering if we were heading for some crazy Colorado high mountain pass, but a quick look at Google Maps made it seem ok, and checking the weather app as Mo headed west on the nice 2 lane road eased my fears a bit. We would be fine. 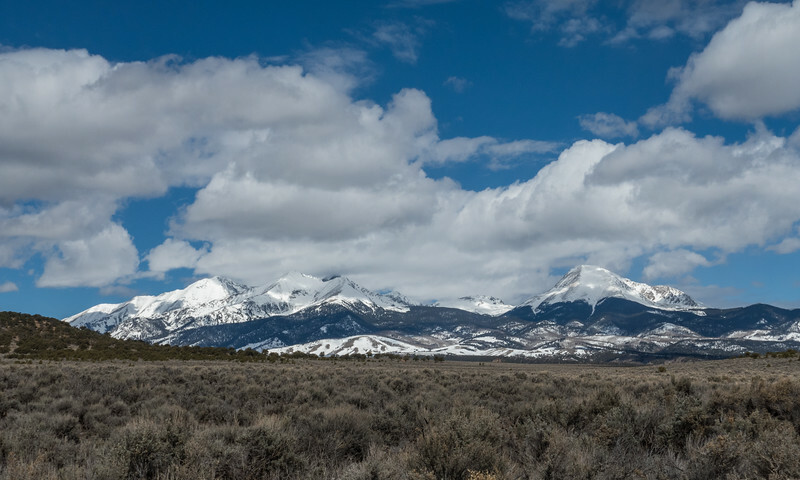 The drive turned out to be gorgeous, with high snow covered peaks all around us, historical towns along the way as we approached Taos and Santa Fe, and once more navigated the freeways from one side of Albuquerque to the other for a night at the Kirtland AFB Family Camp. Morning was a bit of a respite, with a great visit with friends Mary Ann and Gail. We had breakfast at Vick’s Vittles, just a mile from the base, where we shared 25 years or so of memories and some true New Mexican food. I had pancakes made from blue corn flour, with green chilis, cheese, and pine nuts. Perfect. After breakfast we headed west toward Flagstaff, planning to stay once again at the small private park at Meteor Crater where we camped back in 2007 on our first cross country motorhome trip. The day was long, but we still managed to settle in without any trouble to the comfortable campground in time for afternoon sunshine walks with the dog, and a decent supper of leftovers. I knew we would be traveling hard, and made sure I didn’t have to do a lot of cooking for that home run. We left early the next morning, with a bit of a kerfuffle trying to find propane for the cold nights we expected, and finally filling up at more than 3 bucks per gallon at the Love station in Williams. 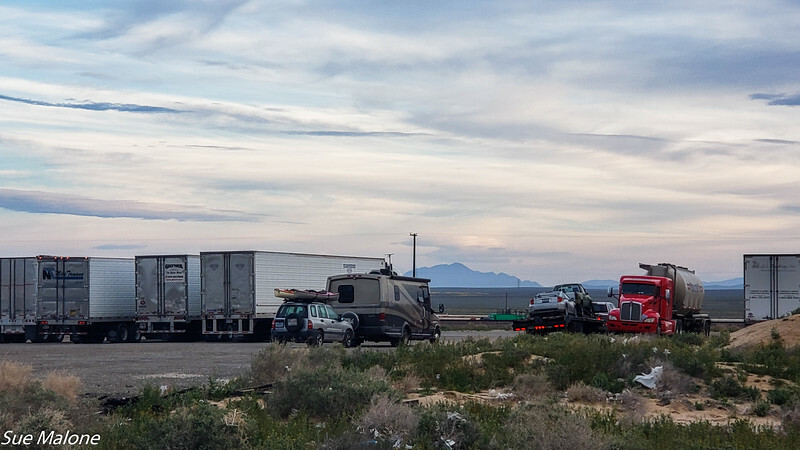 Our night at Kramer Junction was beautifully quiet, in spite of the many trucks that joined us during the night. 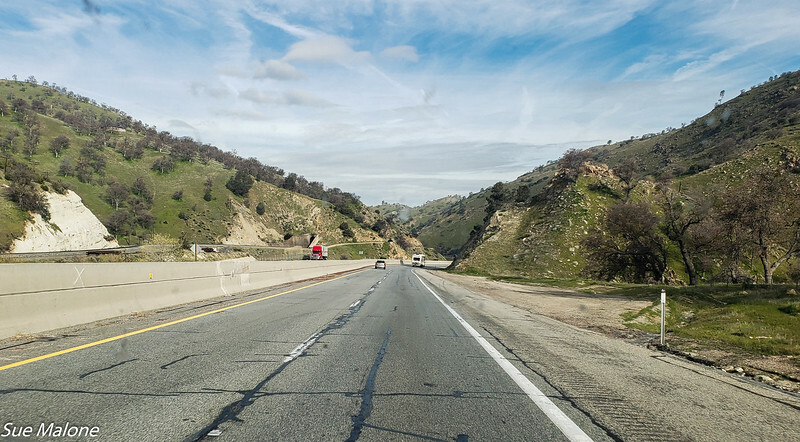 Daughter Deanna, who is a trucker, said that California has strict rules about idling engines, and we only heard the very quiet gentle hum of a few truck generators. 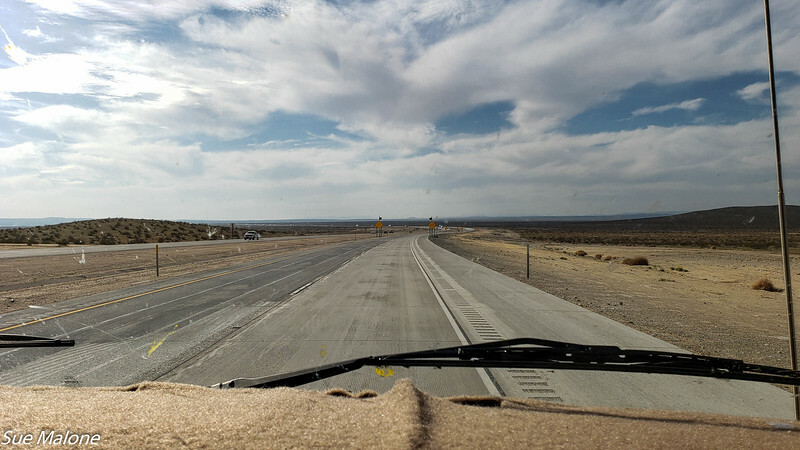 In the middle of the wide open desert along a busy highway it felt safer to be here in the truck stop than alone somewhere along the road. It was a good night. Waking to cloudy skies but no really bad weather predicted for the next leg of the journey, we headed west over the pass through Tehachapi and decided to travel north via Highway 99 rather than farther west along Interstate 5. That choice varies, and it is always a crap shoot as to which road will have more potholes. We got fairly lucky, and didn’t have much trouble with the rain holding off most of the afternoon until we arrived at Flag City RV Resort, our trusty stop that is almost always our last stop before home on our southern sojourns. We settled into our nice level spot, hooked up the electric and the TV, walked the dog, and spent one last night on the MoHo bed before our last leg home over the passes. 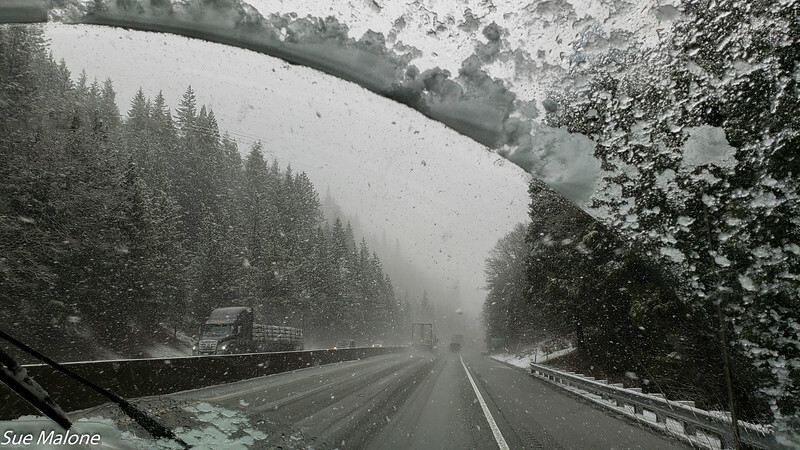 I looked at the weather apps and hoped that we could slip in between the snow storms predicted along our route between Redding and Grants Pass. I have no idea why these snow storms always show up around the end of March or 1st of April, but it seems that we have navigated bad weather on these return trips in early spring. 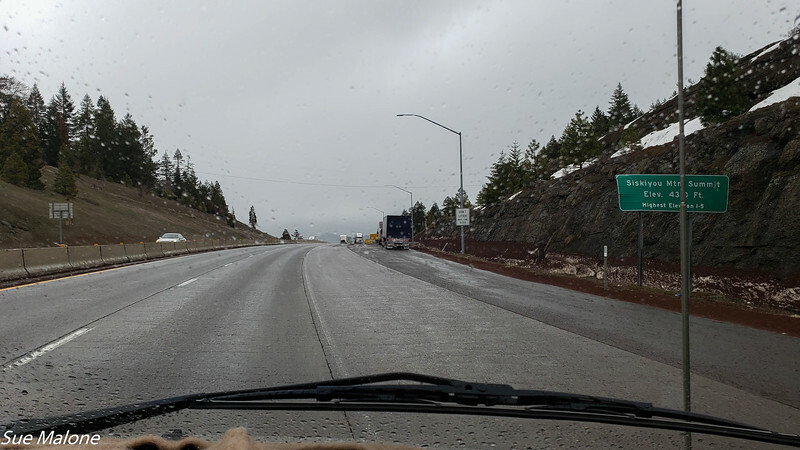 Once again, we got a bit lucky, with the worst of the weather hitting us around Dunsmuir and over Mt Shasta, before we got a bit of a rainy break as we approached the summit over the Siskiyous and into Oregon. In spite of all we have seen across this amazing country, there truly is no place like home. 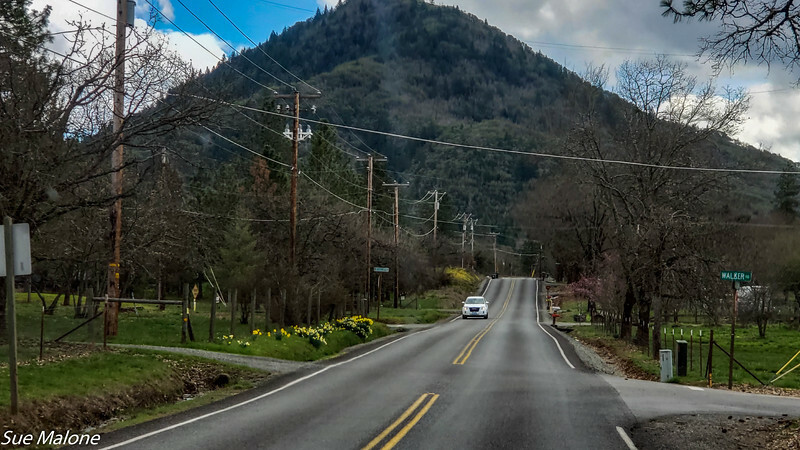 The mountains and hills around Ashland are green, the earliest flowering trees are blooming in their pink and white set off by brilliant yellow daffodils. Here in Oregon, spring is just beginning. We had two gorgeous days of sunshine when we returned, giving us just enough time to get the rigs washed and to settle in before the rains began once again. In spite of the rain, the air feels soft and not terribly cold, the grass in the pasture is a gorgeous green, long enough that it is time to mow once it dries out again. Walking into the house was amazing, and we both wondered why it still smells “new” even after 18 months. Maybe the wood floors? It was wonderful knowing that all was well with the help from daughter Deborah watching over the house while we were gone. The bird feeders were full, the primroses were blooming, the house felt fresh and clean and yes, roomy! 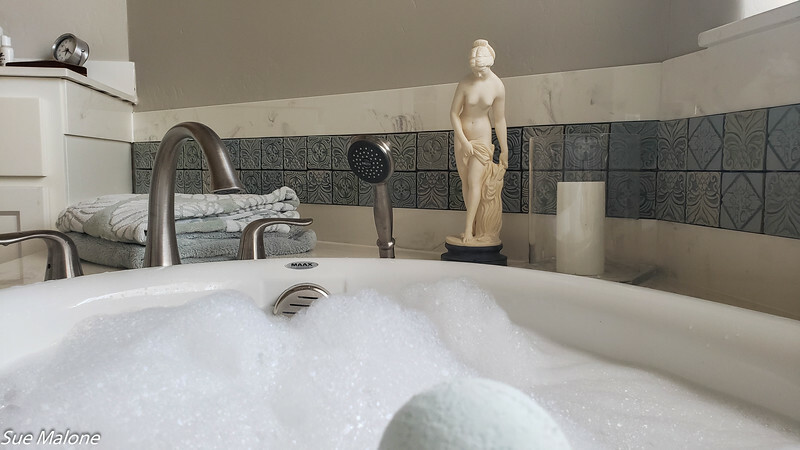 The bath in my deep soaking tub was long and hot, and the bed felt huge. It was wonderful setting the thermostat to the perfect temperature and not having to think about it again. I love traveling, but oh I do so love coming home again. Things that I can take for granted in everyday life loom huge and wonderful when I have been away from them for weeks at a time. It is the perfect combination of going and staying, of traveling and nesting that I love. We feel so incredibly lucky to have a chance to live like this, to enjoy the very best of both worlds. We also feel incredibly blessed and lucky to be home safe and sound with no huge disasters to contend with while we were traveling. On Wednesday, when we arrived in Colorado Springs, the skies were a blue so brilliant and perfect that I was enthralled. What better way to do laundry than to walk through a pine fragrant campground with an armful of clothes in the bright sunshine. I took my time catching up laundry, shaking out rugs, cleaning up the MoHo a bit and preparing for the next few days with the luxury of our home parked in one place. At Peregrine Pines, laundry is not free, but the machines are new and nice and the $1.75 per load for washing and $1.50 for drying is reasonable. 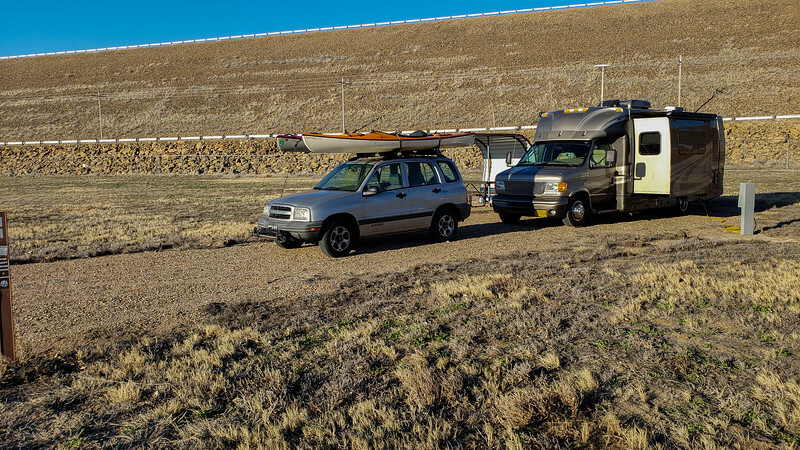 We decided that with the coming days of driving around both Colorado Springs and Denver, it would be a good idea to take the kayaks off the Tracker and lock them up at the campsite. With the cooler temperatures, and visits with friends and relatives on the agenda, there wouldn’t be any kayaking happening. I let Erin know that we were settled in and we made arrangements for the following day. 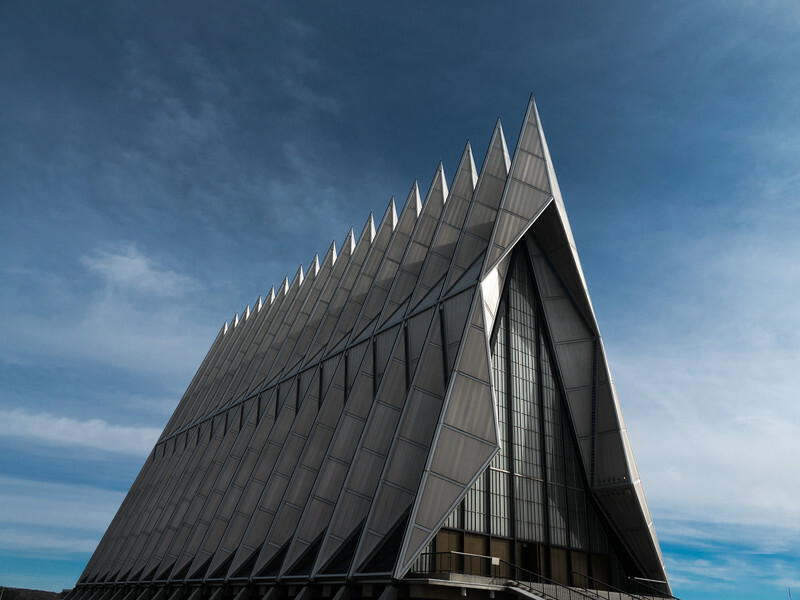 Since we weren’t planning to get together until lunchtime, Erin suggested that we might like to hike the short pathway from the Academy Visitor Center to see the iconic Cadet Chapel that is a landmark visible for a long distance from many parts of Colorado Springs. The morning wasn’t as perfectly gorgeous as the previous day, and the air was chilly. We meandered around the base, which is huge, and found the VC and the trail to the chapel. As we entered the chapel, the sun came through the clouds at just the right moment to illuminate the colorful stained glass windows perfectly. 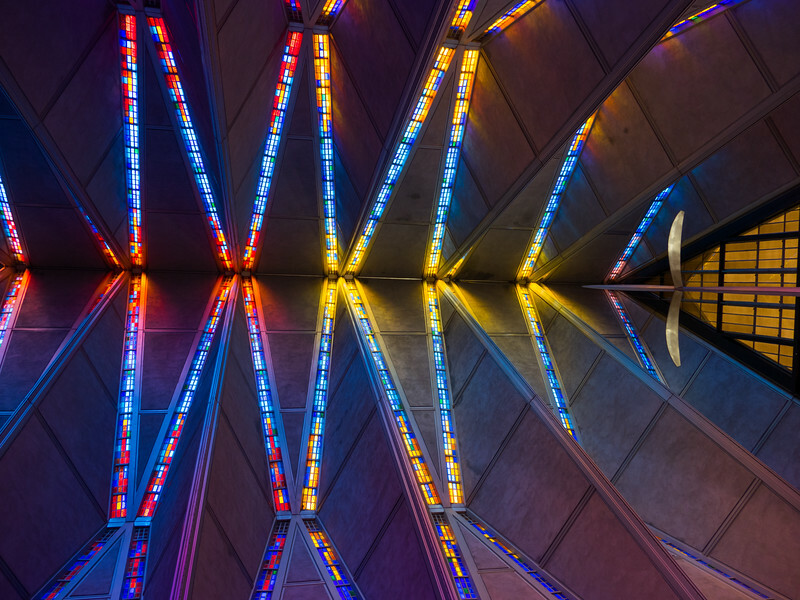 This magnificent chapel was completed in 1962 and in 2004 was named a US National Historic Landmark. There was a docent who showed us around, discussing the architecture, the lighting, and many small details that I might have missed. 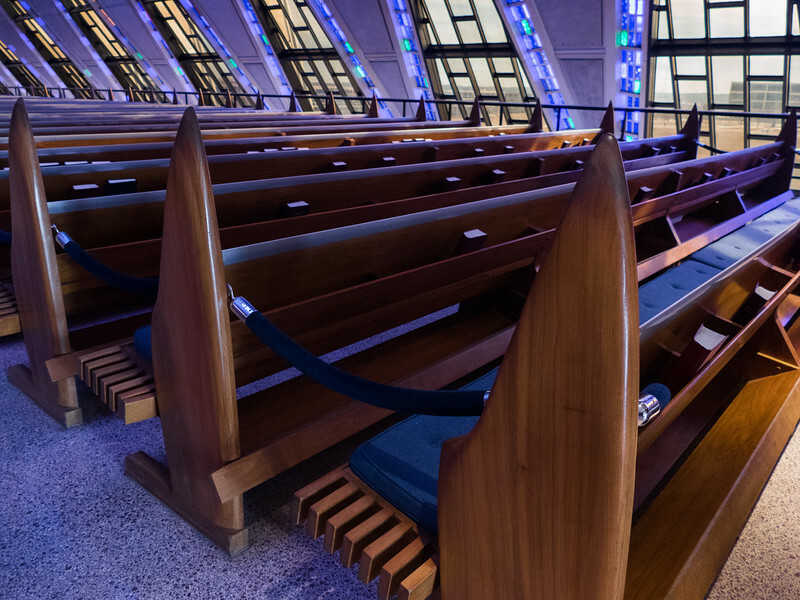 For instance, the ends of the pews are made of walnut and oak, shaped like airplane propellers. The metal railings on the pews are made from aluminum, and represent the wings of an airplane. 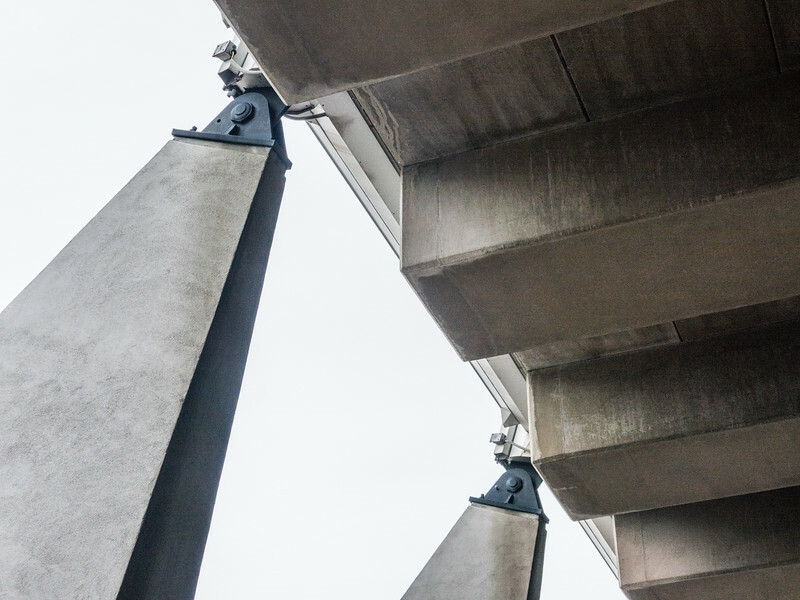 The architecture of the building is fascinating, with huge tetrahedrons bolted together to create the modernistic shape that soars skyward. 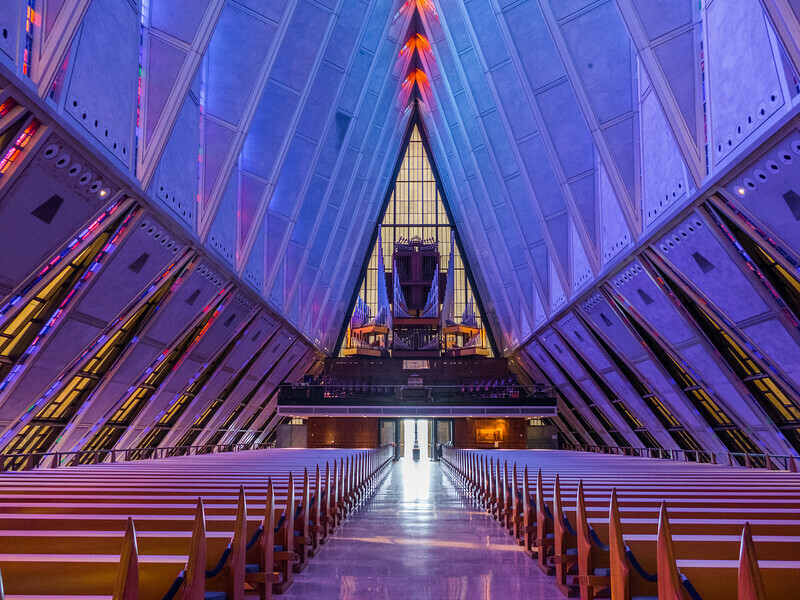 There are services held at the chapel for several denominations so that all cadets are represented. 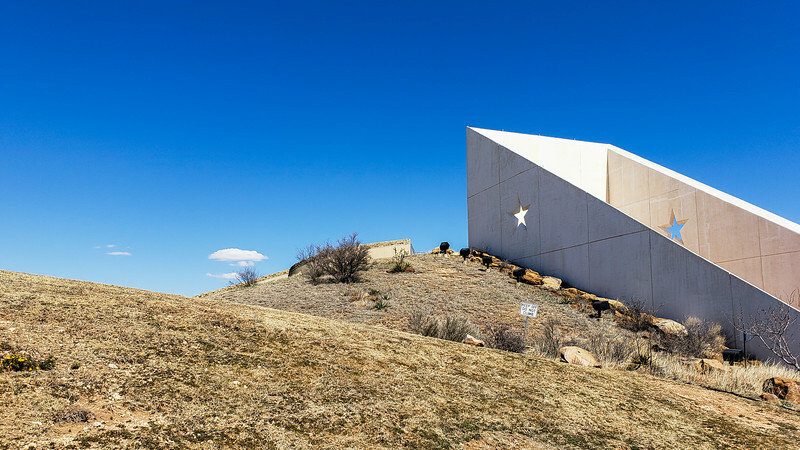 The cross at the front of the chapel is 99 feet tall and is shaped to symbolize not only the Christian cross, but also a soaring bird in flight, or perhaps an airplane. 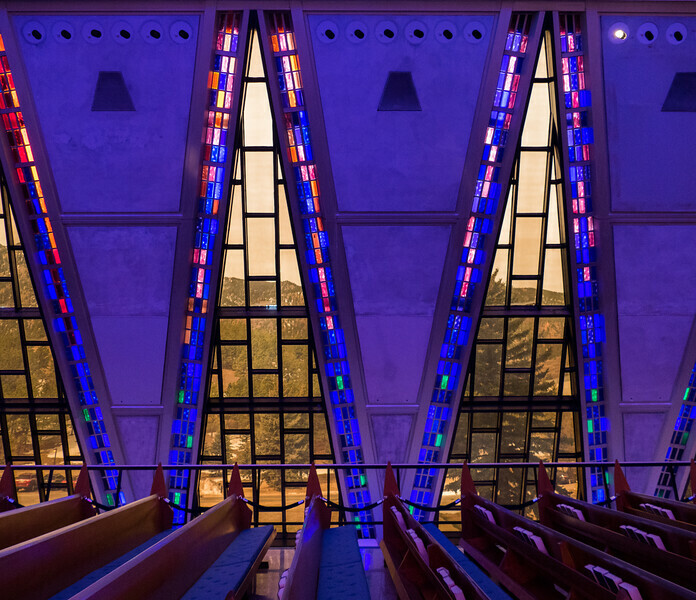 The windows were the most fascinating, with colors and angles that challenged the ability of the camera to capture light, turning everything a bright blue, even though that isn’t exactly how it was perceived by the eyes. The docent pointed out the stairs leading to the Roman Catholic chapel below, in addition to the Jewish Synagogue, and a Buddhist Meditation space. The entire building was so inspirational. I would have loved to be there for a Sunday service, just to hear the magnificent pipe organ, but our schedule demands that we be on the road early Sunday morning, so we will have to save that for another visit. After we returned to the campground, Erin and Mui drove out to our campsite and then suggested we follow them to the lunch restaurant they thought would be a nice place for the four of us. Most travelers with a tow vehicle know about the use of said vehicle as a sort of garage. We were unable to take Erin and Mui in our car because it was crammed full of all the winter clothes we didn’t need in Florida but did need in the Pacific Northwest and in Colorado, with kayak gear, paddles, extra dog food, and wet water shoes. Not a nice place to sit. Erin and Mui had a bit of the same problem. Having only recently ended their full time lifestyle, their car had been without a back seat, and once it was replaced, they had yet to find the proper seat belts. 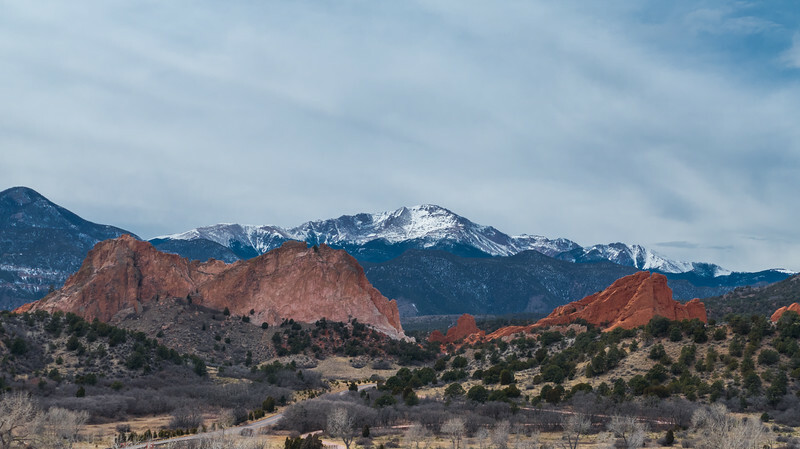 Hence 4 people in 2 cars meandered through Colorado Springs toward the charming historic town of Colorado City. I was delighted with the lovely town, with lots of restaurants, shops full of enticing goodies, and brilliant murals on the old brick walls. We didn’t have time to dawdle, with lunch at TAPAteria next on our agenda. Erin and Mui know good food, so I was excited to experience their choice of restaurant. I wasn’t disappointed and we shared several small plates and a couple of salads. I even tasted Mui’s octopus, a first for me. Our shared pitcher of frosty fruity blood orange sangria was the perfect accompaniment to our delicious meal. After lunch we decided that a trip to the nearby Garden of the Gods would be a great way to enjoy the rest of the afternoon. Once again, we caravanned to the park and began our visit by an exploration of the Visitor Center. The view from the outside deck is perfect, looking west toward the red rock fins of the park with a backdrop of snow covered Pikes Peak. We decided to take a few minutes to see the park movie, shown in a round theater with seats that are supposed to represent a spaceship. 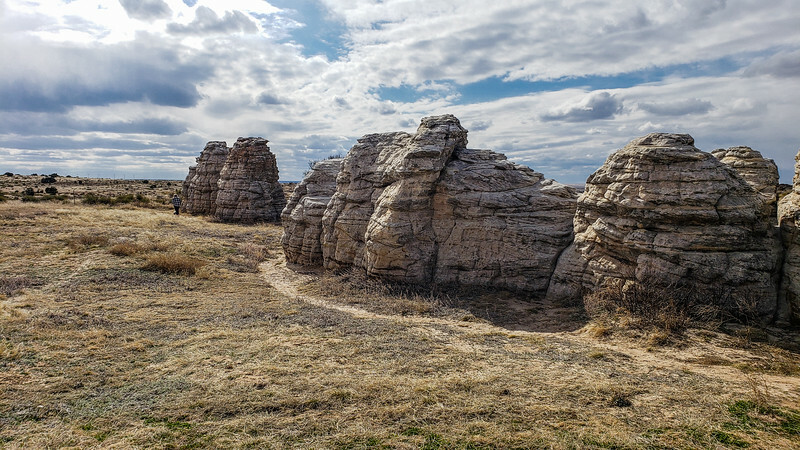 The movie travels back in time a few billion years, explaining the creation of the rock formations of the park over the eons. Of course I loved it, even though it did seem that it was made mostly for kids. 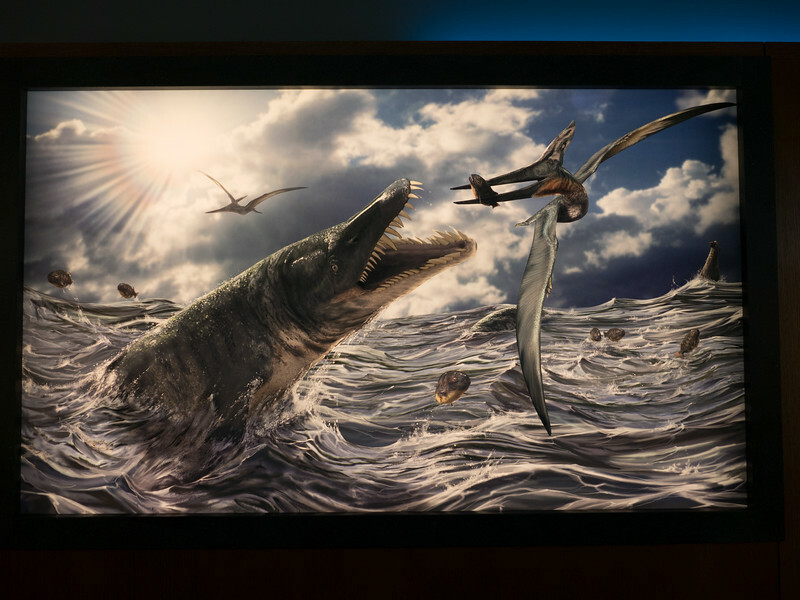 The displays at the Visitor Center were beautifully done, and I especially fell in love with the backlit artist’s renderings of the progression of time through the ages with the associated plants and animals. With the afternoon passing by very quickly, and the somewhat windy and chilly air, we decided that a drive through the park was more reasonable than hiking. The caravan once again took off for the 7 mile loop drive, stopping at the viewpoints to enjoy the panoramic views, and competing with a lot of people for parking spaces. 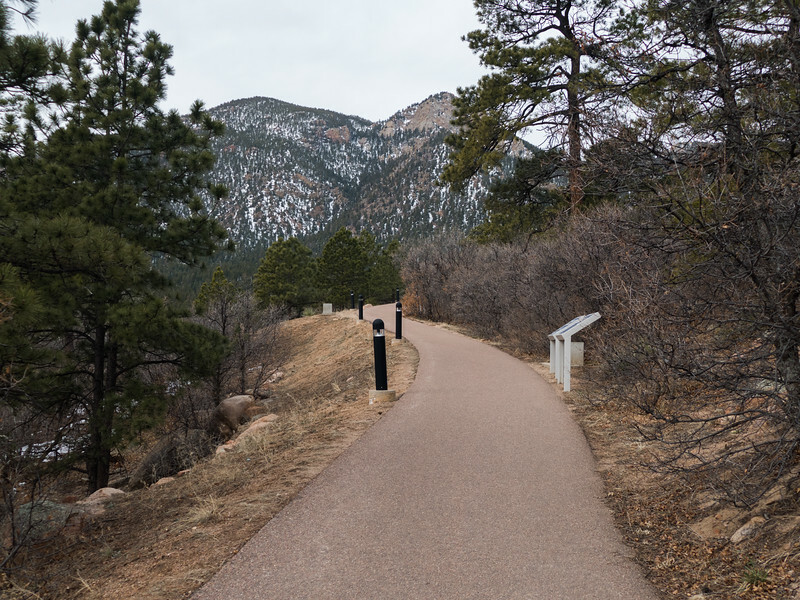 The Garden would be a lovely place to hike, and I will have that on my agenda for my next visit to Colorado Springs as well. 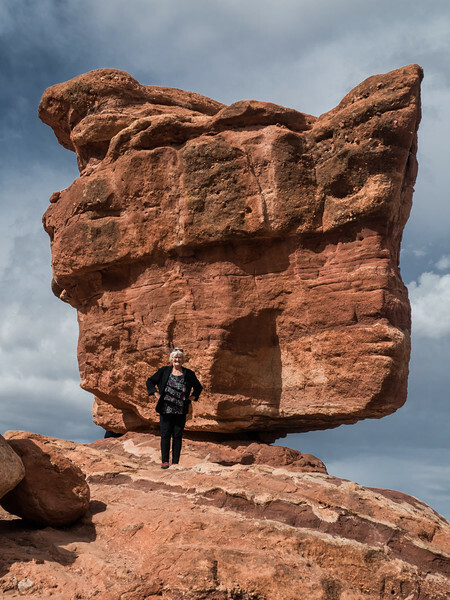 My favorite moment, however, was when I decided to climb up the rock around Balanced Rock so Erin could get a photo. The minute my feet hit that slickrock, I was in heaven. Climbing slickrock takes at least a dozen years off my life, and instead of doddering along trying to keep from stumbling around, I am suddenly a mountain goat, bouncing up the rocks without a qualm. I love love love slickrock, probably my most favorite feeling underfoot. Slickrock is not slick at all, and almost vertical hiking feels so simple. 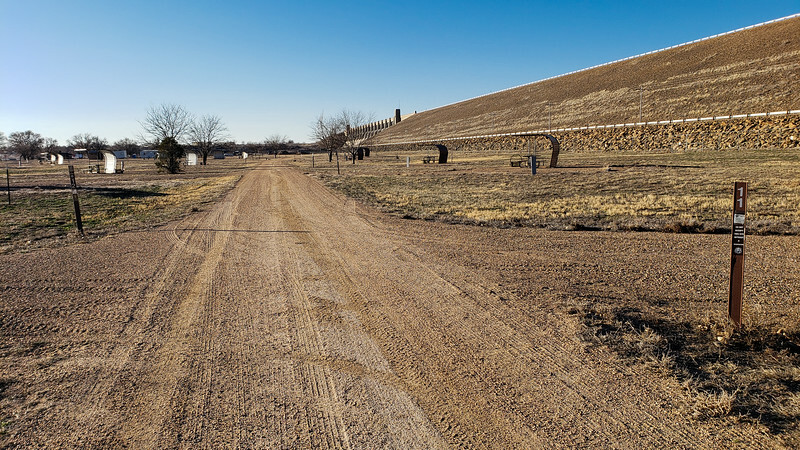 One last time, the two car caravan meandered across Colorado Springs back to the western edge facing the prairie toward Erin and Mui’s brand new home. What a treat! Having just completed the building of our own new home in the last couple of years, we knew exactly how it felt to have it finally finished. We were thrilled to have the honor of being their first guests. One of my favorite moments came as we entered the lower level where all of Erin’s beautiful needlepoint and framed photographs were lined up along the wall waiting for their someday placements. Having been blogging friends with Erin for at least a decade now, I have seen occasional photos of her work. It was quite a thrill to see it in person. So beautiful! I can hardly wait to see how their home evolves as they add their touches and make it their own. I didn’t take photos at their house, figuring that Erin could share what she chooses at her leisure, but let me tell you, that view out the windows facing the prairie is spectacular. Across from their home is open space and an arroyo that is home to antelope and other wildlife. 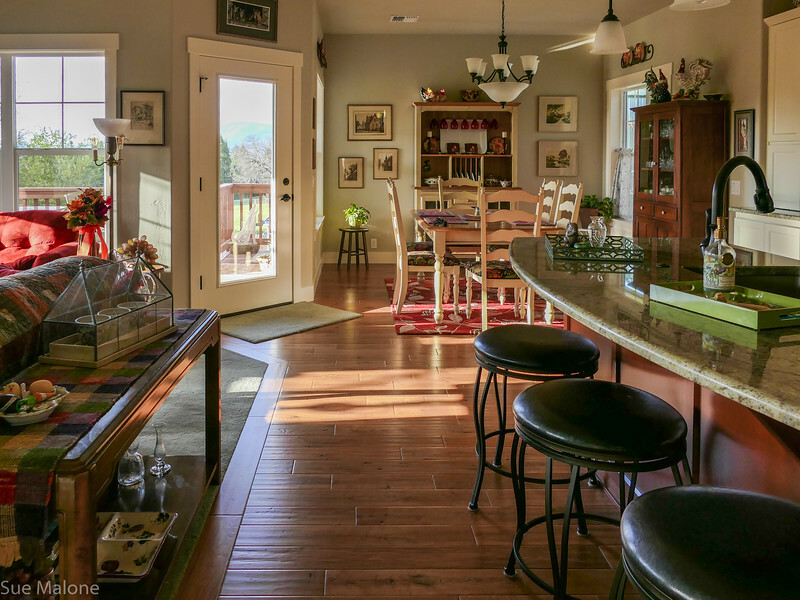 Here is a blog post from Erin that ends with a sunrise from those gorgeous windows. As the sun lowered in the sky over the mountains, we bid our farewells for the day, making plans to get together one more time before Mo and I resume our journey westward. 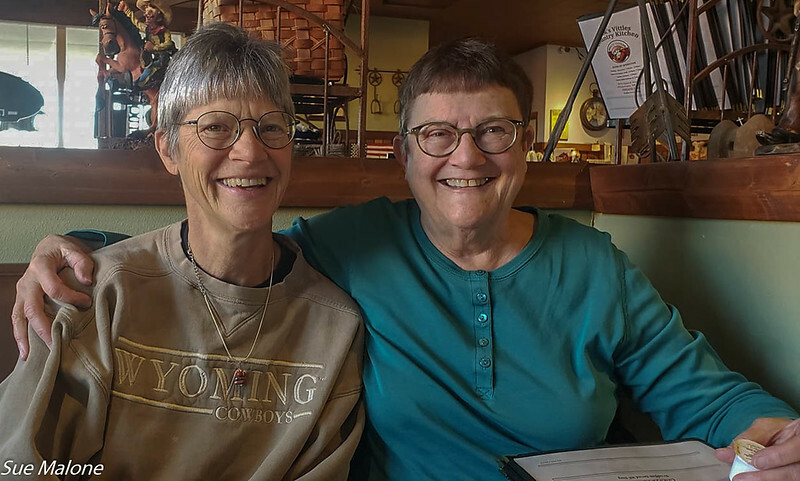 The next morning, Mo and I left the MoHo safely parked at the base, and loaded up the Tracker for a trip north to Denver to spend a night with Mo’s sister Edna. I had to laugh, because even for a single night, traveling with our little dog is as bad as having kids. We had to pack up the dog crate, the dog bed and blankets, dog food, and halter and leash, making sure we didn’t miss anything. Mo and I didn’t bother to take much more than a toothbrush and some nightclothes. 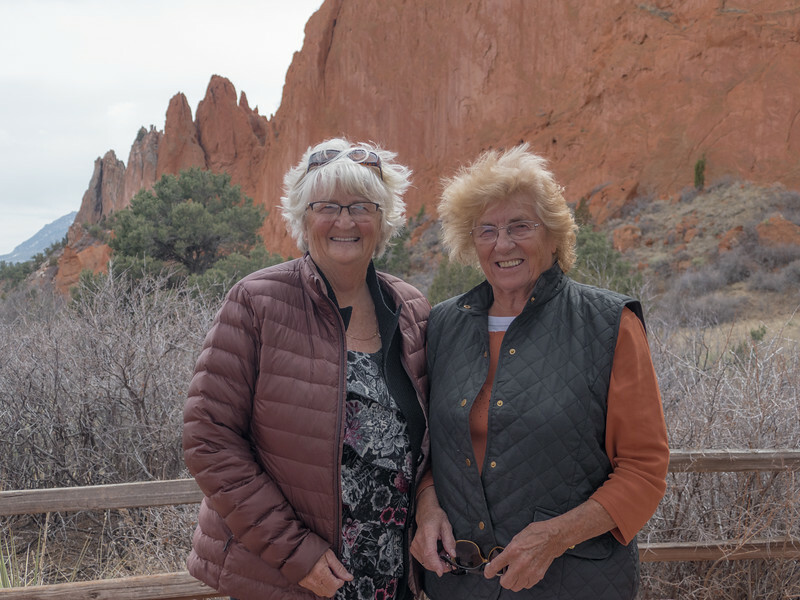 The trip to Denver was uneventful, and we arrived at Edna’s early enough in the day to share some morning coffee and conversation before sitting outside in the lovey sunshine and taking Mattie for a nice long walk through the neighborhoods. We spent a quiet afternoon visiting and collaborating on a 1000 piece puzzle that Edna had previously started. Made me want to buy a puzzle, but it also made me a little bit crazy. Early evening we ordered in pizza and enjoyed the company of Edna’s daughter Marci and her husband John, who came over to join us. The next morning we shared a nice breakfast Edna of leftover fabulous cherry pie before getting on the road back south. Overnight, the crazy weather in Colorado changed again, and snow covered the hills as we traveled back south toward Colorado Springs. There was a big slowdown on Interstate 25, long enough to give me a chance to get a photo of gorgeous Pikes Peak in the morning sun. Once back home, I let Erin and Mui know that we had returned. 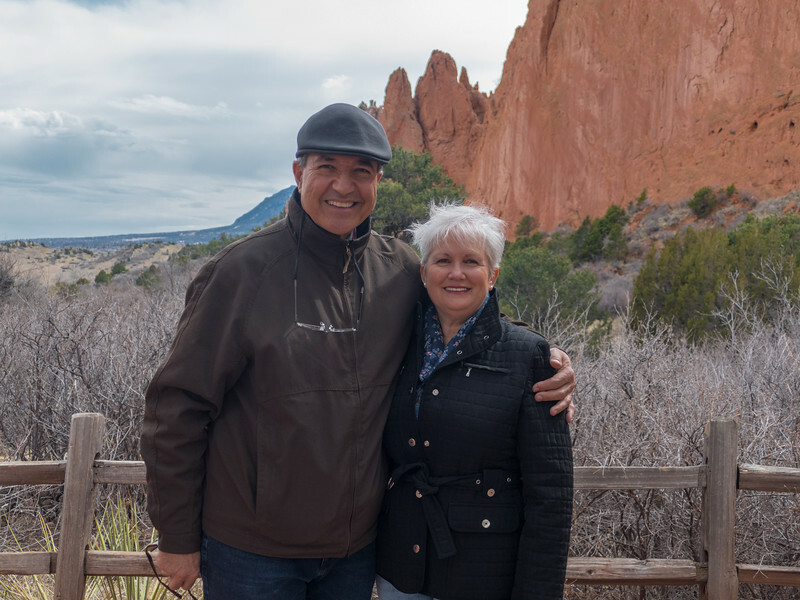 Initially we had thought we might do something as dramatic as visiting the Broadmoor Hotel and Manitou, but Mo and I were feeling a bit worn, and we all decided to keep it simple. 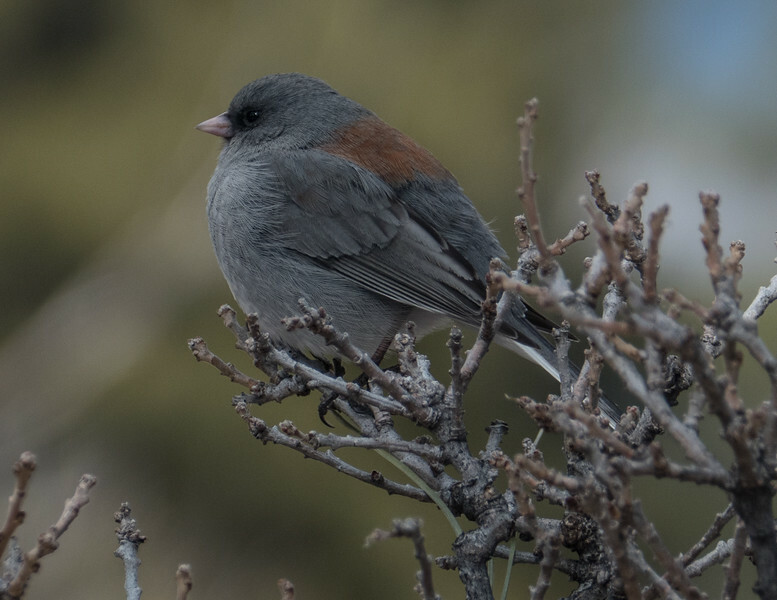 Having camped at Peregrine Pines for a few weeks prior to moving into their home they knew the good spots. 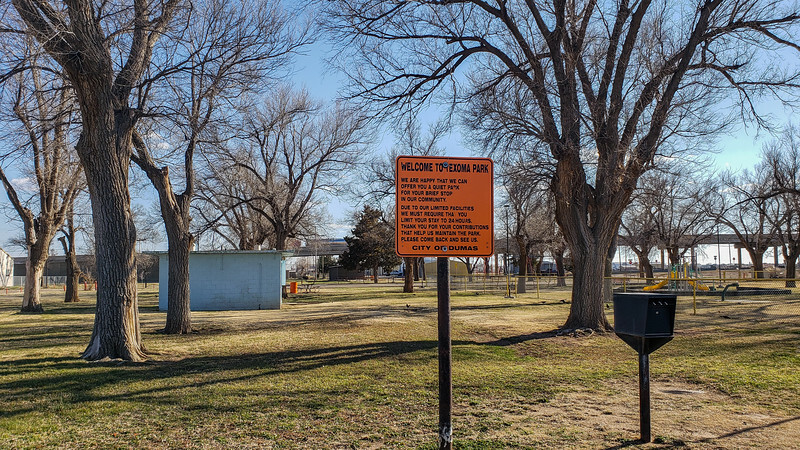 Erin suggested a walk around what we think is a water retention pond, and a visit to a special spot at the base that we might have missed otherwise. Once we knew they were on their way back to the campground, we said the magic word “walk”, in fact I am pretty sure we even spelled it out, which doesn’t help at all because Mattie knows how to spell a few important words. The walk was lovely, with views of Pikes Peak, and we discussed how nice it would be to get up early enough to take photos at sunrise with reflections on the pond. Something I never quite managed to do. W –A –L –K ?? Really, Mom? what’s the hold up?? 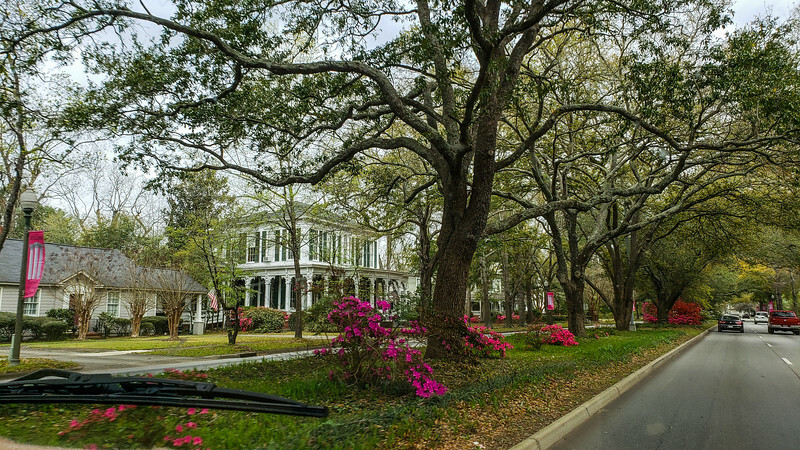 The Heritage Trail at Doolittle Hall was lovely in the afternoon light, with memorials and statues honoring famous graduates of the Academy. 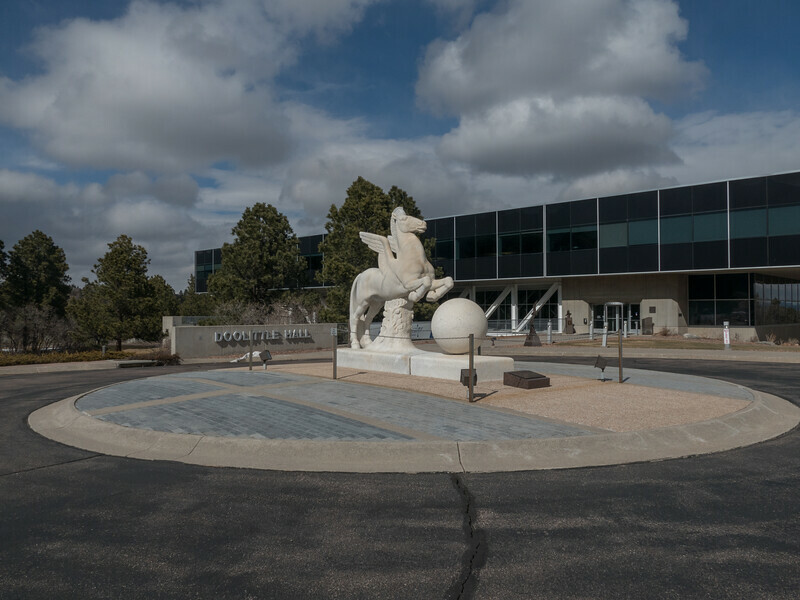 Doolittle Hall and the Association of Graduates honors the heritage, legacy, and history of the USAir Force Academy and its graduates. 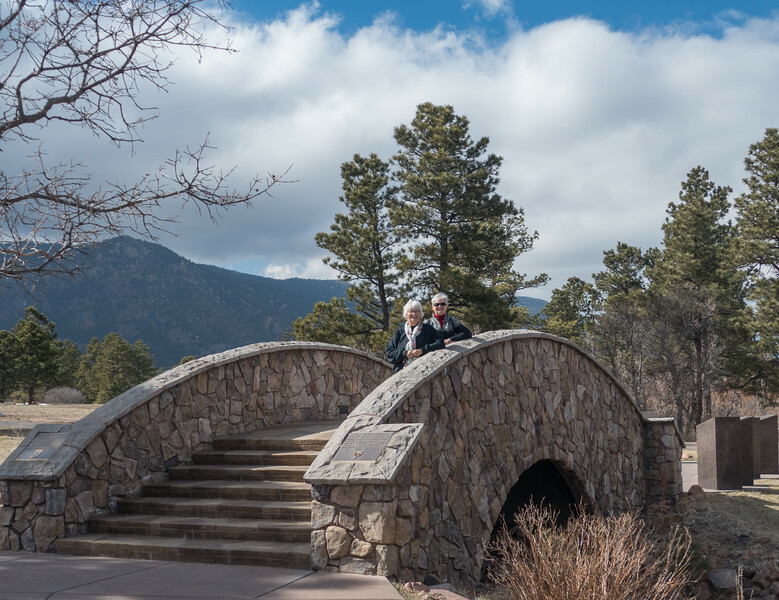 This lovely bridge is called the Challenge Bridge and was donated by the graduating class of 1959. We enjoyed the wildlife along the trail as well. 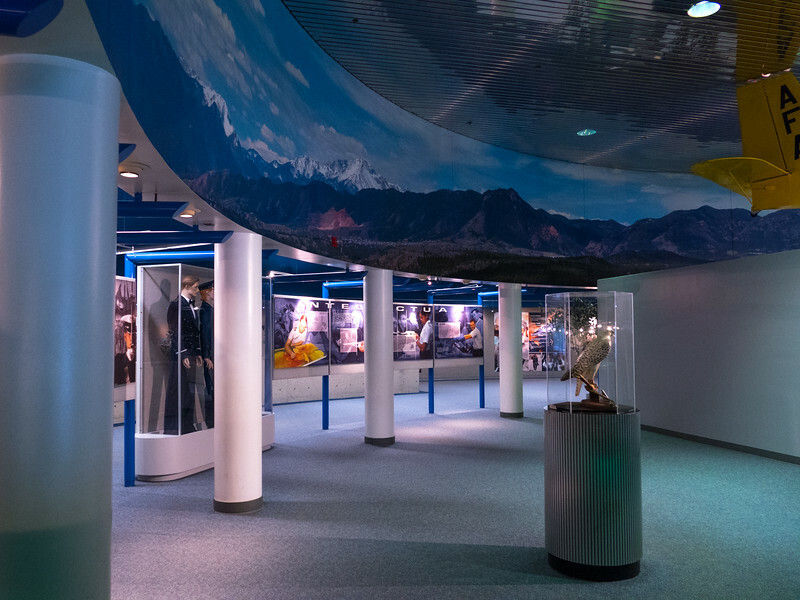 We then meandered back toward the Visitor Center Mo and I had passed on our first morning of explorations and spent some time viewing the wonderful displays of Academy history and cadet life. As I read more and more of the codes of conduct of Academy cadets, I was so moved by what kind of inspiration it must be to young men and women to be part of such a tradition. If only part of the people that attend the Academy live up to such lofty ideals, we are lucky to have them in our world. Once again, the afternoon was waning, and it was time for Erin and Mui to lead us to supper. And what a great supper it was. The big surprise was that the Italian bistro type restaurant that we visited was in a mall, and such a mall it was. 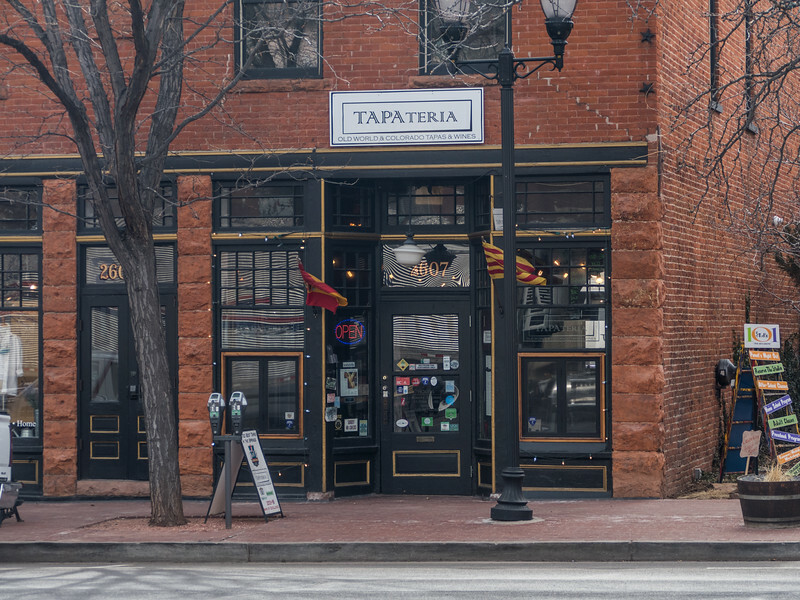 Colorado Springs seems to be a hotbed of wondrous shopping, and I really wished I would have had time to explore some of the real sticks and bricks stores that were clustered around our restaurant, Il Vicino. Add that to the list of things to do when someday we return for a visit to Colorado Springs! What a fun place to be. What a yummy place and a truly delicious supper. I can’t believe we didn’t take any photos that evening, but we were enjoying the conversation, knowing it would be the last real time visit for who knows how long. 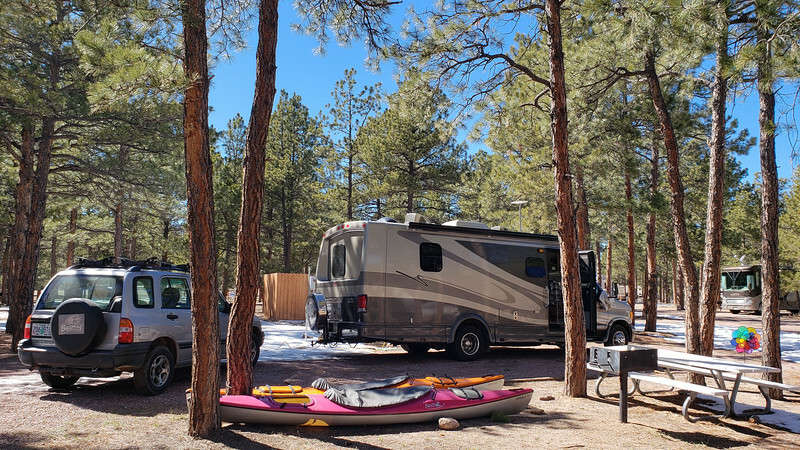 We bid our final goodbyes and headed back to our little home on wheels, waiting patiently in the forest at the USAFA campground for the next leg of this long adventure. The days are starting to all run together. When traveling east on I-10, crossing Texas, it seems like it goes on forever. I can’t remember how many days it took us to get across that state, but I am sure it was at least four. 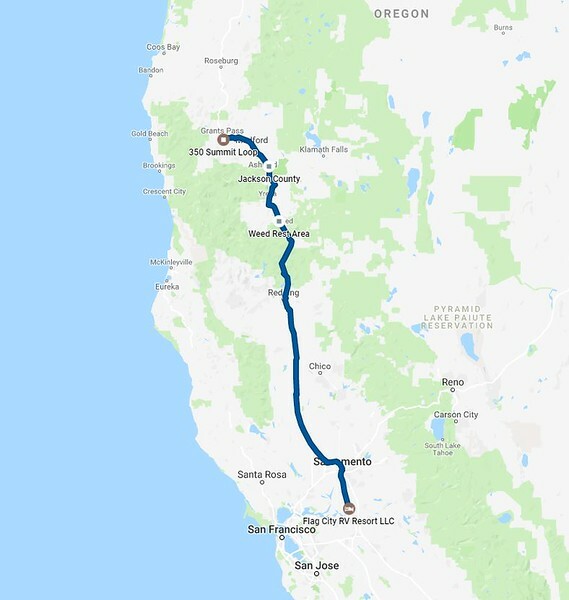 What I have discovered, is that the name of the state doesn’t matter, one state, five states, whatever, it takes days and days to get back west. 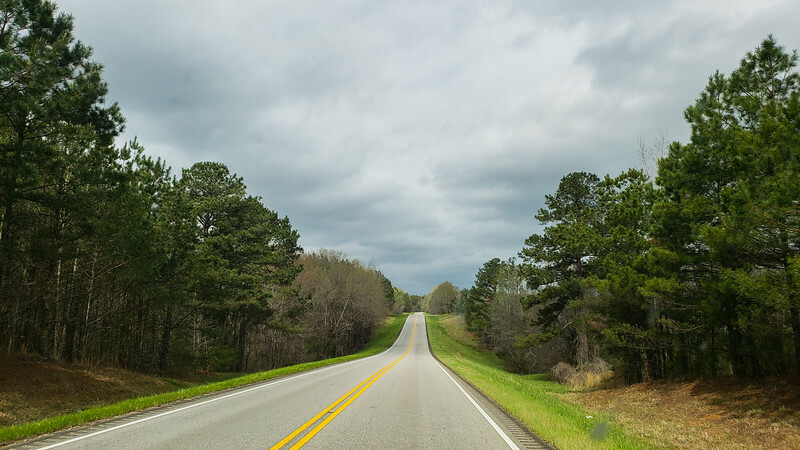 When we left Okefenokee, our main focus was heading home, taking I-40 back west as an alternative to I-10. It helps to have a bit of different scenery, new landscapes to wake up the eyes and heart. I know there are many sights we haven’t visited along the 10, but my ache to see new sights is waning a bit as our trip exceeds two months. I am sorta ready to be home. We left our little campground in Albany, Georgia on Thursday morning the 14th of March, traveling west and north. Our original plan included driving toward Nashville, where we had a reservation at Arnold Air Force Base for two nights. We thought it might be fun to see a little bit more of Nashville than we saw back in 2007, and to continue west toward Memphis. We did have an important destination. My mother, deceased in 1952, was born in Palestine, Arkansas. I have spent several years attempting to track down my mother’s father and relatives on that branch of my family with little success. With the help of Ancestry DNA tests, I discovered that I truly do have family connections right there in Palestine. We had been invited to park at my cousin Rita’s place as long as we wanted. Our visit will get a post of its own, but that will come next. No matter where you travel this time of year, weather can get in the way of the best laid plans. The huge “bomb cyclone” that hit the upper Midwest was coming east in a long red, orange and yellow band that stretched from the lower southwest corner to the upper northeast corner of our route, spawning flooding, and scariest of all, tornados. There was no escaping it. Should we hunker down and wait somewhere for it to hit us, or simply drive fast through it and hope it misses us. As my daughter Deanna said, you are moving and the tornados are moving, no matter what you do, it is a crap shoot. 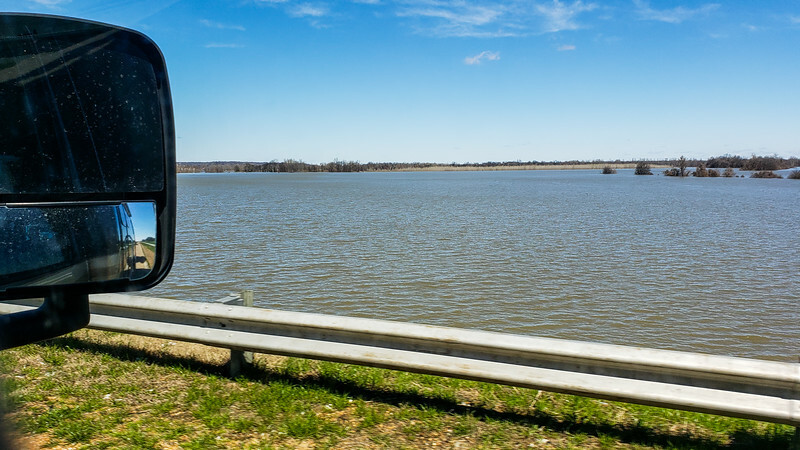 We decided that we should take the most direct route possible to get to Arkansas, skipping the sight seeing and cancelling the Nashville reservations. All I had to do when calling the office was mention the tornado watches we were traveling through and we got a full refund. Nice. Our goal on the 14th was to simply get through the line of tornado watches. We crossed Georgia in lovely sunshine, entering into Mississippi and some of the most kerthunkety roads we have traveled since I-10. We passed Montgomery and Birmingham, navigating the freeways without much trouble. I thought a lot about the important historical locations in both of these cities. 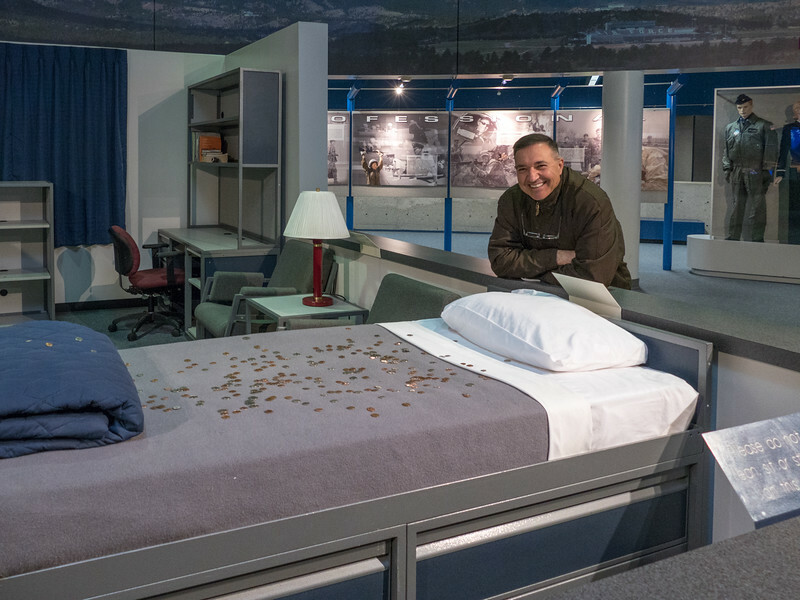 I have read great stories about visits to both cities and wished I had the weather, the time, and the energy to stop and spend some time appreciating the changes we have experienced in our country since the early days of the Civil Rights Movement. Did I mention I was a bit burned out on city sights? I found myself a bit glad that I had the excuse of tornado warnings to keep us moving north and crossing Mississippi in record time. I joked that there would surely be a tornado shelter at the Cracker Barrel. There were only a few scary moments, as we watched the swirling black clouds north of Birmingham building, and fought the erratic wind gusts. The sky never did turn green, and the warning system app never sounded an alarm for tornado conditions going from watch to warning. There were a few intense downpours, but no hail, for which I was extremely grateful. That night, once again we overnighted in the free parking lot of a Cracker Barrel in Tupelo, Mississippi, safely on the other side of the tornado watch. Nickie teased that we must love Cracker Barrel food, but not so much. We do love their free parking lots however, and so far at each one we have used, the lot has been quiet. In Tupelo we were the only rig in the lot, as we were previously in Florida. 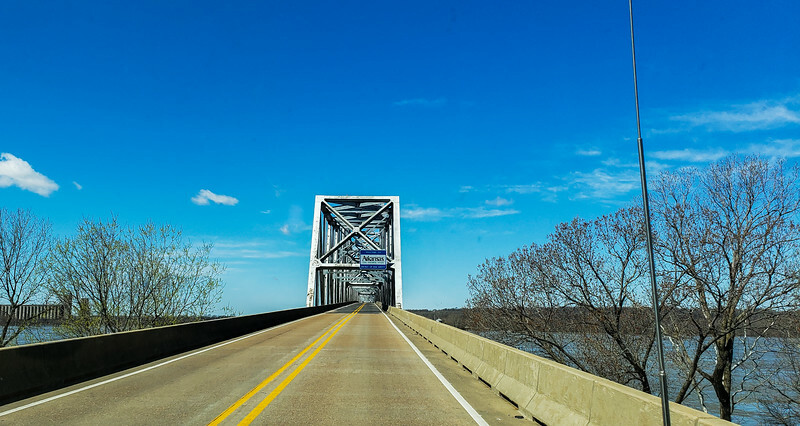 On the morning of the 15th, we continued north and west, crossing the Mississippi River mid day and arriving at my cousin’s place early afternoon. We stayed two nights, and as I said, the story of that visit will come in another post. On Sunday morning, the 17th, once again we pointed the rig west along I-40, crossing Arkansas and most of Oklahoma before settling in once again at another Cracker Barrel, and another night alone in a quiet parking lot. There were a lot of hotels surrounding the restaurant, but it seemed perfectly quiet and safe, even on the fringe of a big city near the airport. This time we decided to succumb to the big country breakfasts that they are famous for. Mo had French Toast for the first time on this two month trip, and I had some kind of great scramble thing, with biscuits and fresh squeezed orange juice. We don’t eat out a lot, and this was our first breakfast out on the entire trip. Our lovely breakfast kept us satiated through the rest of Oklahoma into the Texas Panhandle toward Amarillo. We haven’t traveled the Panhandle since 2010, and we were still unsure if the weather was going to cooperate with our plans to turn north toward Colorado. There were inklings of snow in Colorado Springs, and if that continued, our plan was to spend the night in Amarillo, and continue west toward Albuquerque. 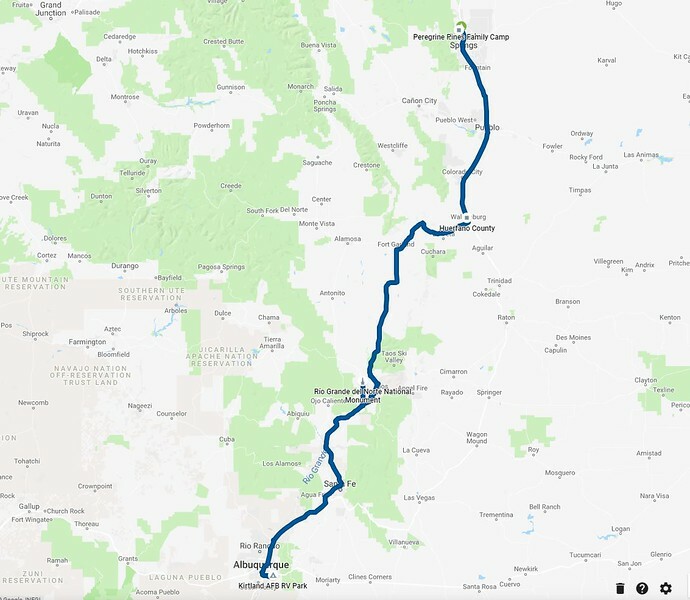 Checking the weather, messaging with Erin, and looking at options for routing, we finally decided that it would be OK to make the journey north. 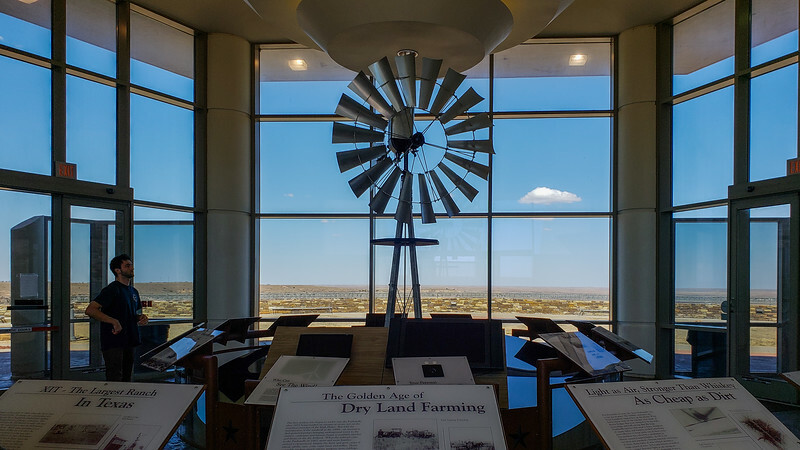 Instead of stopping in Amarillo, we continued north along highway 87 toward the little town of Dumas, Texas. Using All Stays, we found the Dumas City Park, called Texhoma Park, a free camping spot with free electricity. Free? yeah, it really is free, with a limit of 24 hours only. There is a donation box if you wish to help keep the place available. Once again we were almost the only rig there for the night. Our only company was a gray RV with signs all over it in Spanish, basically advertising their travels from Chile to Alaska. I did a bit of sleuthing, I found a photo of the same rig on Facebook, and ended up messaging with the person who posted that photo who had seen them in Chile. Crazy world. He and I did some more hunting, and actually found the Facebook page of the family, who have been on the road for two years. I had a lot of questions about that entire process. Do they have to get visas for each country they pass through? Their facebook page says they are supporting themselves by selling things, but how do they do that in the US? It is a mom and a dad, two kids and a dog. They left their ordinary lives and ordinary jobs of teaching in Chile to travel all the way to Alaska. I guess the RV dream is everywhere. When we woke up and planned a leisurely 200 mile drive to our next destination, we were shocked to see that the plug-in voltmeter was showing 18 volts and we were on store! It dropped down to 14 part of the time, so we really didn’t understand what was happening. We tested a few things before deciding that we needed to find some help. I found a mobile RV repair guy, Bob’s Mobile RV Service, who was back south of Amarillo, but he was so kind and helpful. He said it could just be the meter itself, but that driving between 14 and 15 volts might not be a problem to get us to a repair service. He then made some calls and set up a visit for us at the local Ford Dealer. What a sweet guy. He even called back a few hours later to be sure that we were OK. If you are ever in the vicinity, and need help I would highly recommend his service. 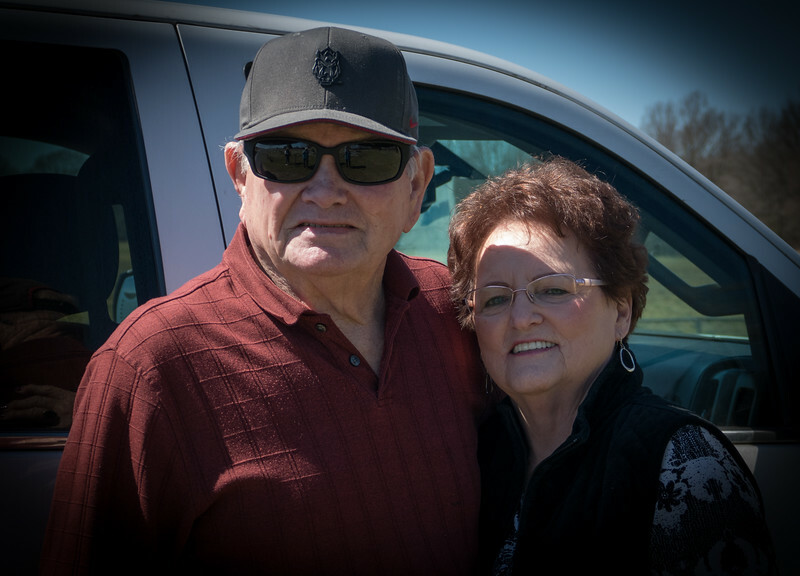 After driving to the small Ford dealership in Dumas, we waited a couple of hours for a technician to check our batteries, and alternator. Everything was fine, and as Bob had suspected, it was our voltmeter that had failed. The Ford dealer didn’t charge us for the service and we were on our way just a few hours later than planned. Nice that we had a shorter mileage day ahead. Speaking of the RV dream, I am definitely not a full timer. We have been traveling for 2 months now, and it has been wonderful. I am so glad we can do it. I am also so glad that we are heading home. I have lost a bit of the excitement, and the thrill of exploring new places has taken a back seat to the thrill of once more getting back west. 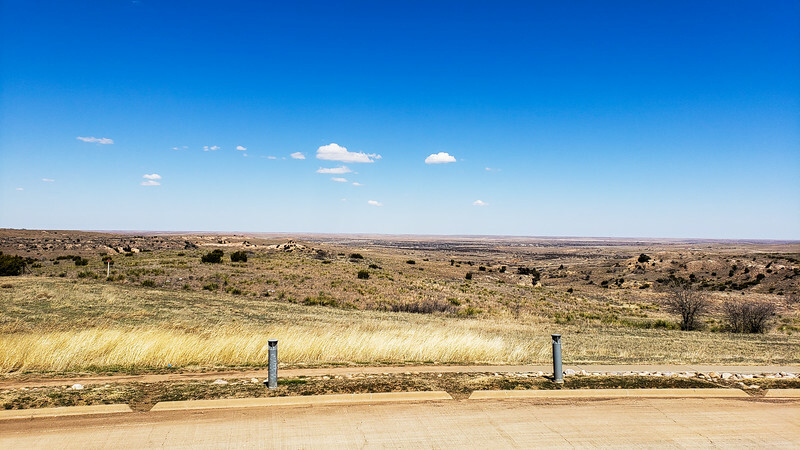 The thrill of returning to our little town, and our green lovely acre, and our comfortable home is overshadowing the thrill of seeing more brown barren trees and brown barren grass on the high plains of the United States. 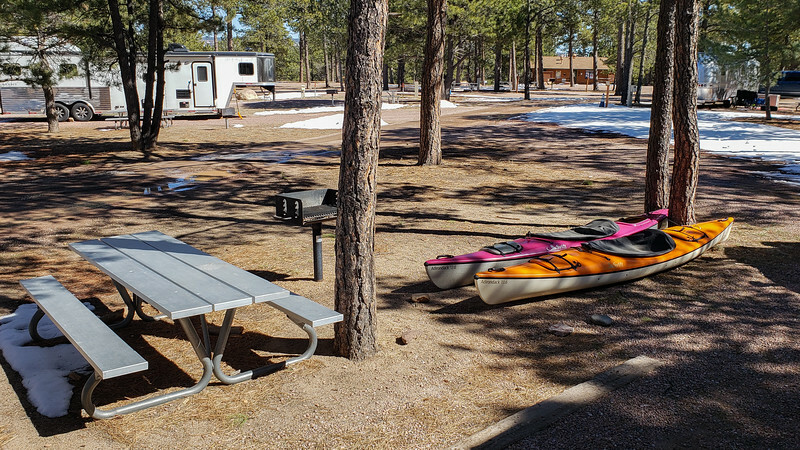 Following the snow predictions for the east side of the Rockies, we knew that it would be cold but not snowy for a night at John Martin Reservoir State Park. We stayed at this park back in 2010, even spending an evening kayaking. It was September then, not March, and wasn’t as cold. We knew the temps on this night in March were going to drop to the 20’s. I discovered by pure chance that the park is now reservation only, and made a reservation at the last minute as we drove north. When we arrived, signs on the posts said do not occupy without a reservation, but same day reservations were allowed. Only problem, there is limited cell service at the park and one would have to return to the little nearby town of Hasty to attempt to get service. Once at the park, my choice of a site seemed really stupid. On the website it is very nearly impossible to get any kind of idea of what a site might be like. There are no photos. We ended up all alone in a loop over by the dam. It turned out nicely, however, since it was completely quiet, and I could take Mattie out running off leash without any problems. It was too cold to be on the lake anyway! Yesterday morning we got up to a windy 24F degrees, that quickly warmed to 34F degrees but the wind was biting cold. On the road by 9, we knew we had a short day ahead driving west toward Interstate 25 and our final miles toward Colorado Springs and the USAir Force Academy Peregrine Pines Family Camp. We have read about this beautiful camp over the years, and seen beautiful photos from Erin’s blog about the trails and the chapel, and knew it would be a good place to stay. Erin and Mui loved this area so much, it called to them when they made their choice to end their full time lifestyle and settle down once again to a sticks and bricks home. (You can read about it here). We look forward so much to seeing their new home and spending time with them here in Colorado Springs. Still not quite sure about our return route. Once again, weather will be the determining factor. Mo isn’t too excited about returning back south to the 40 and I am not that excited about traveling over the mountains on the 70 or through the cold windy country of Wyoming on the 80. 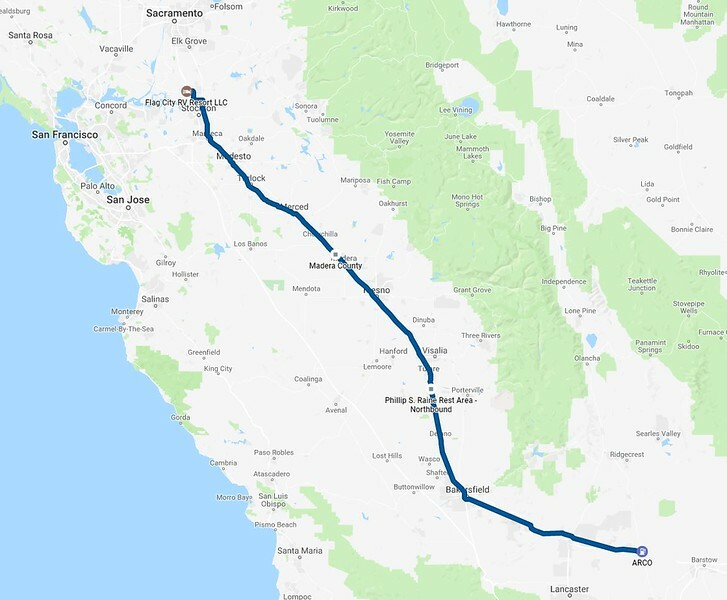 That route on the 80 is actually 400 miles less than my choice of returning back to the 40 and then having to go back north. Ah well. As I said, the choice will be made next Sunday morning when we exit Colorado Springs. 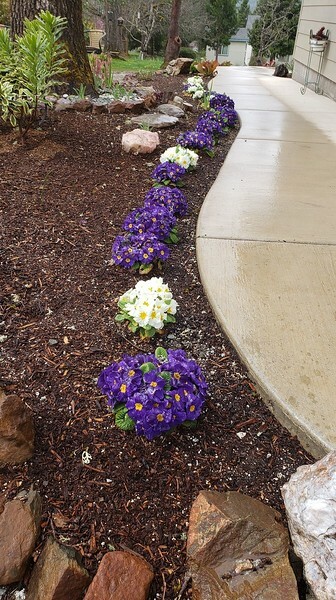 Hoping that a few extra miles going back south will be rewarded with warmer temperatures and maybe even some desert flowers as we continue our run home west toward Grants Pass. Either way, home is the prize waiting at the end of the journey.